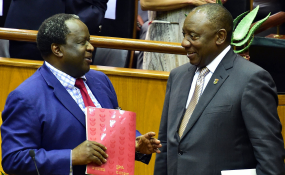 Finance Minister Tito Mboweni delivered an uncompromising Budget on Wednesday, cutting the public wage bill and closing the piggy bank for state-owned enterprises. But the tale on Eskom was not quite complete, not in rands and cents, nor in policy. Eskom definitely gets R23-billion in the 2019 financial year, and the same for the next two years, or a total of R69-billion over the medium term to the 2021/22 financial year. This is for it to deal with its precarious finances, including its R419-billion debt and its restructuring into three entities under an Eskom Holdings umbrella body. With this comes conditions such as the appointment of a chief reorganisation officer, to be appointed jointly by the ministers of Finance and Public Enterprises. That's the clear-stated, public commitment by the government as outlined by Finance Minister Tito Mboweni to MPs in his maiden Budget speech. "The national government is not taking on Eskom's debt. Eskom took on the debt. It must ultimately repay it. We are setting aside R23-billion a year to financially support Eskom during its reconfiguration."